Based on my past purchases, Amazon had been recommending Edward’s menagerie by Kerry Lord for ages. However, I only really looked at it when I spotted it on a bookshelf at the Glasgow branch of Waterstones last August. I was immediately taken by the lovely cute designs and I couldn’t resist buying a copy. When I got home, and on closer inspection of the book, I became rather daunted by the (for me) complex patterns. So the book ended on my bookshelf. Not much later I spotted Kerry Lord with her animal collection on Create & Craft TV. She demonstrated how easy it is to crochet the animals and that you only really need to know a couple of different stitches to make any of the animals. I picked up my book of the shelves and with the lovely Toft yarn I bought at the Knitting & Stitching show at Alexandra Palace I set out to stitch Simon the Sheep. 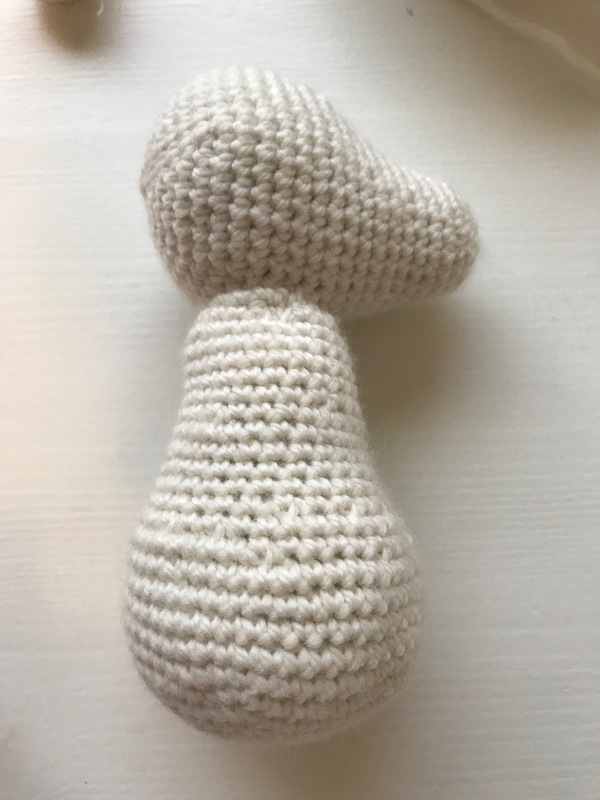 It was my first time crocheting for a while and I had never stitched in the round and although Kerry had made it look easy in the demonstrations I did find it rather difficult. Especially counting the stitches and rows I found very difficult. When knitting in the round, rows cannot really be distinguished because you are really crocheting a continuous spiral. I came to conclusion thatI needed some stitch markers to keep on me track. I did not have them at the time and once again my project and the book ended up in a drawer. Along came the Scheepjes CAL, which I have been enjoying so much since the middle of last February. 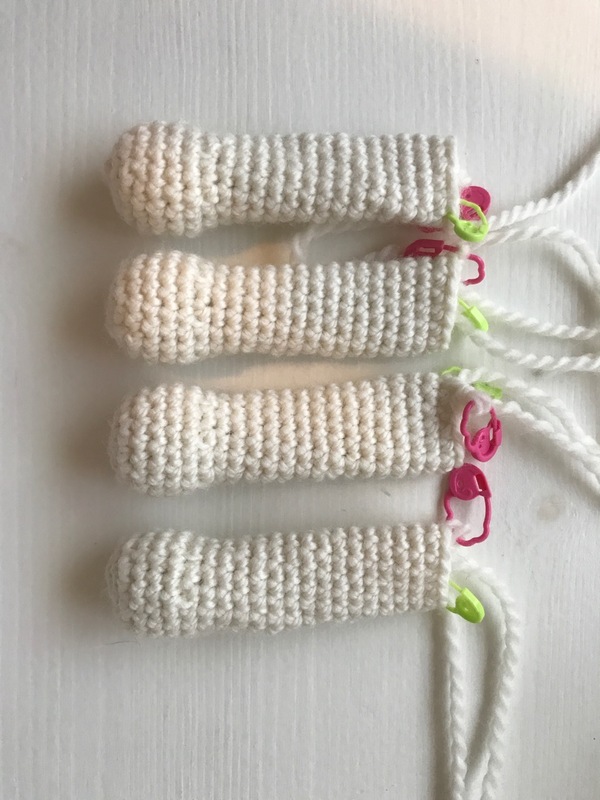 The CAL consists mostly of double crochets (DC), which is the stitch needed for all of Ed’s Animals and at the Meet & Greet with Kirsten last week I crocheted in the round which went really well for a first timer. 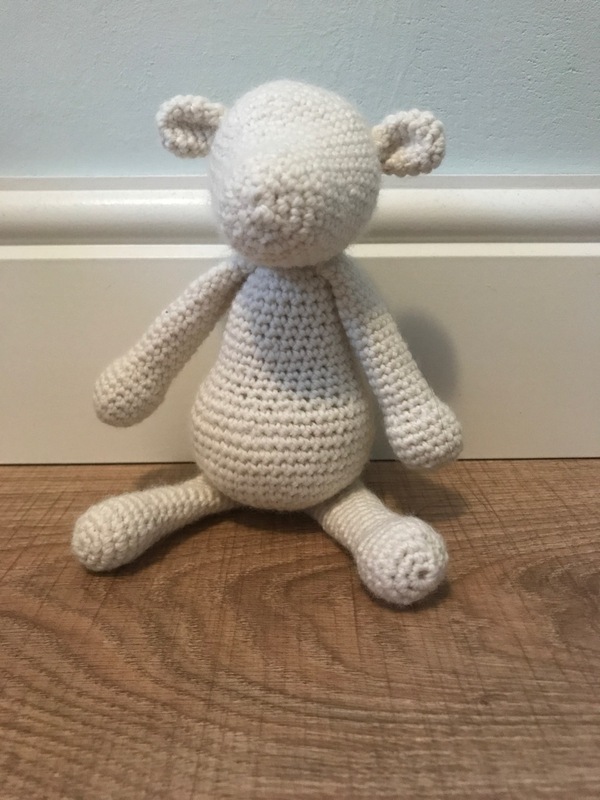 When I finished week 9 of the CAL ahead of schedule and with a dreich Easter Weekend ahead of me I decided to have another go at Simon the Sheep. Admittingly you do have to pay close attention and use your stitch markers diligently but apart from that the patterns are very easy as they only require a few stitches. If you are like me and a bit scared about knitting in the round and about counting, the following tips might help you. Use a knitting counter, to count each row you have done, so you can keep track of the patterns as the rows are difficult to count on the fabric. When you start a row, stick a stitchmarker in the first stitch you have made before you stitch any further. Stitch your row until you are back at the stitch marker. Count your stitches in that row before continueing onto the next row. Remove the stitch marker, stitch the first stitch of the next row and insert the stitch marker back into the first stitch and continue as before. Count after completing each row, it seems teadious but if you have made a mistake at least you have a chance to fix it. Use a lockable stitch markers as split rings can come loose and that means you are lost. I left the legs open until I finished all four so I could they are all the same and have the same amount of stuffing. I did find the stuffing a bit difficult, as you should not overstuff them as they become less tactile and they simply don’t look as good. Not having touched one it is difficult to judge whether the stuffing is right, too little or too much. They have to sit upright so I have stuffed the body and head quite a bit, so it holds its shape but so you can still squash it. I have stuffed the feet about the same but left the legs empty. I used Toft’s own premium toy stuffing, which come in a cute Ed’s animals canvas bag. The next challenge was to sew all the body parts together. With a little help from the book and the online videos I managed to stitch the bits together correctly (I think!). I did use some t-pins first to attach the legs and ears to check whether the positioning was correct before attaching them. The next challenge I hadn’t quite anticipated, crocheting the ‘woolly bit’. It is not particularly difficult, even though the instructions state to be random in their positioning, and I am not very good at random. However, it does take forever and it is quite repetitive. As I really wanted to finish my sheep I did go on a bit too long every time. It did take me about 3-4 evenings to get the ‘woolly bit’ finished whereas the rest of the crocheting took just slightly longer. It is well worth it though as Simon does look like a proper sheep now. For the eyes I used embroidery tread (DMC 310) as I didn’t have any black wool in the house. I used 12 strands together and I oversew about 4 times. The picture below shows the lovely cute Simon the Sheep. He looks really adorable and soon he will be enjoying life on the rear shelf of my car being driven around the country and further afield.